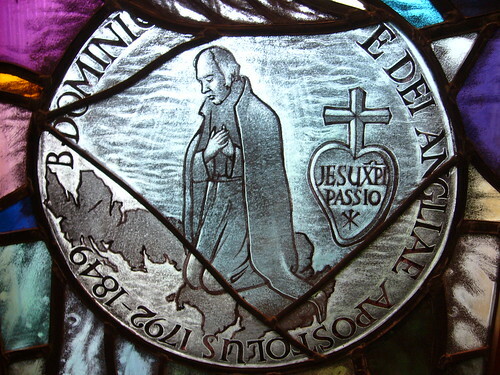 Today is the Feast of Blessed Dominic Barberi, who brought the Passionists to England and whose many sufferings were rewarded when he received the now-to-be beatified John Henry Newman into the Catholic Church or, as Newman himself put it, the one true fold of the Redeemer. For many years the heart of Father Paul [of the Cross] was expanded towards a northern nation, with which, humanly speaking, he had nothing to do. Over against St. John and St. Paul, the home of the Passionists on the Celian, rises the old church and monastery of San Gregorio, the womb, as it may be called, of English Christianity. There had lived that great Saint, who is named our Apostle, who was afterwards called to the chair of St. Peter; and thence went forth, in and after his pontificate, Augustine, Paulinus, Justus, and the other Saints by whom our barbarous ancestors were converted. Their names, which are now written up upon the pillars of the portico, would almost seem to have issued forth, and crossed over, and confronted the venerable Paul; for, strange to say, the thought of England came into his ordinary prayers; and in his last years, after a vision during Mass, as if he had been Augustine or Mellitus, he talked of his “Sons” in England. It was strange enough that even one Italian in the heart of Rome should at that time have ambitious thoughts of making novices or converts in this country; but, after the venerable Founder’s death, his special interest in our distant isle showed itself in another member of his institute. On the Apennines, near Viterbo, there dwelt a shepherd-boy, in the first years of this century, whose mind had early been drawn heavenward; and, one day, as he prayed before an image of the Madonna, he felt a vivid intimation that he was destined to preach the Gospel under the northern sky. There appeared no means by which a Roman peasant should be turned into a missionary; nor did the prospect open, when this youth found himself, first a lay-brother, then a Father, in the Congregation of the Passion. Yet, though no external means appeared, the inward impression did not fade; on the contrary, it became more definite, and in process of time, instead of the dim north, England was engraven on his heart. And, strange to say, as years went on, without his seeking, for he was simply under obedience, our peasant found himself at length upon the very shore of the stormy northern sea, whence Cæsar of old looked out for a new world to conquer: yet that he should cross the strait was still as little likely as before. However, it was as likely as that he should ever have got so near it; and he used to eye the restless, godless, waves, and wonder with himself whether the day would ever come when he should be carried over them. And come it did, not however by any determination of his own, but by the same Providence which thirty years before had given him the anticipation of it. At the time of our narrative, Father Domenico de Matre Dei had become familiar with England; he had had many anxieties here, first from want of funds, then still more from want of men. Year passed after year, and, whether fear of the severity of the rule—though that was groundless, for it had been mitigated for England—or the claim of other religious bodies was the cause, his community did not increase, and he was tempted to despond. But every work has its season; and now for some time past that difficulty had been gradually lessening; various zealous men, some of noble birth, others of extensive acquirements, had entered the Congregation. Passionist Synod Blog and more…. The Synod of the Passionists, the biennale meeting of our General and Council, Provincials and other pezzi grossi will be held at our retreat house at Cuernavaca, Mexico, from 6 to 17 September. 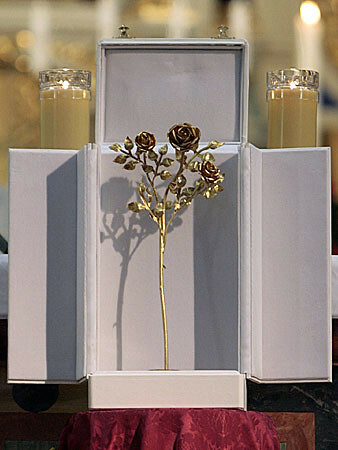 You can find the recently set up Passionist General Synod Blog here. This is the link to the English version of the blog; there are also Spanish and Italian versions. Another blog I saw for the first time today is Nicky’s Blog, subtitled Living my Life with Passion. Nicky is a novice in Holy Spirit Province and lives at Saint Brigid’s Retreat, Marrickville. I enjoyed reading the About Me section. At Father Stefan’s suggestion, I visited Altötting a few years ago; there are links to my pictures of the shrine in this post on Pope Benedict’s 2006 Visit to Altötting. Yesterday in Lima, Peru, the General Chapter of the Sisters of the Cross and Passion elected a new Congregational Leader (=Superior General) and today they elected the Congregation Leadership Team (-what we male Passionists call the General Council). The new Congregational Leader is Sister Maria Angelica Algorta. Her Consultors are Sister Anne Culliton, Sister Rosaleen Murray, Sister Elissa Rinere and Sister Moya O’Cleary.